Media captionNicholas Hart says his daughter Averil's "death was avoidable"
A teenager who "starved to death" in a matter of weeks was failed by "every NHS organisation that should have cared for her", a review has found. 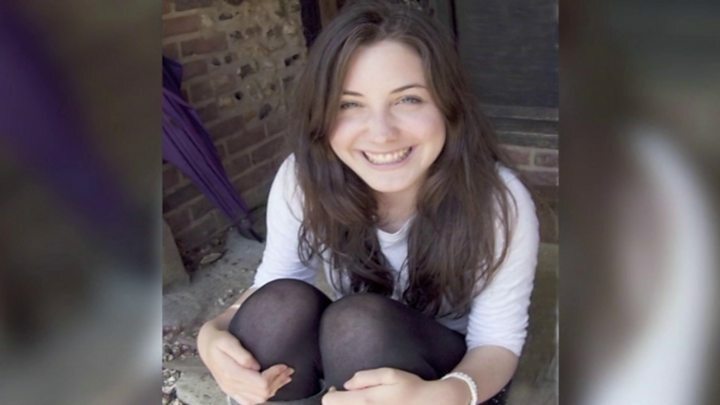 Averil Hart, 19, died in 2012 after her anorexia rapidly worsened at university in Norwich. Her father Nicholas said in just 10 weeks she went from being fit and healthy to "being at death's door". The Parliamentary and Health Service Ombudsman (PHSO) found her death could and should have been prevented. The NHS services involved say changes have been made, with one saying it accepted the report's findings. Miss Hart, the youngest of three sisters, from Newton, near Sudbury, became unwell after her A-levels and spent 10 months as an in-patient at Addenbrooke's Hospital in Cambridge. She was discharged to study creative writing at the University of East Anglia. Miss Hart was found collapsed at the university in December 2012 and taken to the Norfolk and Norwich Hospital by ambulance but saw no specialist eating disorders clinician for three days after admission, by which time her condition had deteriorated. She was transferred to Addenbrooke's Hospital on 11 December. Overnight her blood sugar fell to very low levels, but she did not receive appropriate treatment for this and became unconscious, suffering brain damage. She died three days later. Image caption Averil Hart's father says his daughter "literally starved to death"
The ombudsman found Miss Hart did not receive "appropriate care and treatment". "In addition, the local investigation into her death was wholly inadequate with the organisations involved being defensive and protective of themselves, rather than taking responsibility," the ombudsman's report said. Miss Hart's father Nicholas Hart, who lives in Newton, near Sudbury, said: "As a parent I suppose it is a great relief to finally know that the words you knew were true all along and that Averil's death was avoidable. "It is good to know that the report itself will enable other children and families to potentially not have to go through what we have been through. "It was a needless death, it did not have to happen. It took only 10 weeks for her to go from fit and healthy to being at death's door." Ombudsman Rob Behrens said: "Averil's tragic death would have been avoided if the NHS had cared for her appropriately. "Sadly, these failures, and her family's subsequent fight to get answers, are not unique. "The families who brought their complaints to us have helped uncover serious issues that require urgent national attention - I hope that our recommendations will mean that no other family will go through the same ordeal." Dr Bill Kirkup, who led part of the investigation, said: "I hope this report will act as a wake-up call to the NHS and health leaders to make urgent improvements to services for eating disorders so that we can avoid similar tragedies in the future." Andrew Radford, chief executive at the eating disorder charity BEAT, said: "The PHSO report is very clear, if the eating disorder had been recognised earlier and effective and timely care was put in place, Averil Hart's death would have been prevented. "We await a response from the Government and NHS England who must learn and take action following this tragedy, we cannot continue to fail people with eating disorders. "We must see good, joined-up intensive home and community-based treatment for people of all ages, and in all locations across the UK. This does require the NHS to reorganise but it will deliver improved outcomes for patients and considerable cost savings to the NHS. "It is also clear there were multiple failings across the health service in the lead-up to this tragedy, and the behaviour of each responsible part of the NHS in evading and obfuscating justice is appalling, and piled even more distress on an already distraught family. This requires further investigation and action taken to ensure it cannot be repeated. "This tragedy demonstrates, once again, the devastation eating disorders can cause." A spokeswoman for the Norfolk and Norwich Hospital said: "We met Averil's family in 2014 to offer our sincere condolences for their sad and devastating loss. "Since then we have taken into account the learning from this tragic event and our structure and processes have been reviewed." A spokesman for Cambridge University Hospital said: "The trust would like to repeat the apologies previously made to Averil Hart's family and accepts the findings and recommendations in the ombudsman's report. "When Averil was transferred to Addenbrooke's in December 2012, she was already very unwell but her death, at that time, may have been avoided had failures in her care not taken place. "A thorough investigation has been carried out, lessons have been learned from what happened to Averil and a number of changes made." The Norfolk Community Eating Disorder unit, which was tasked with providing community care to Miss Hart, has been approached for comment but is yet to respond. The University of East Anglia declined to comment on the report, claiming it had "been informed that legal action is pending subject to the outcome of an inquest".